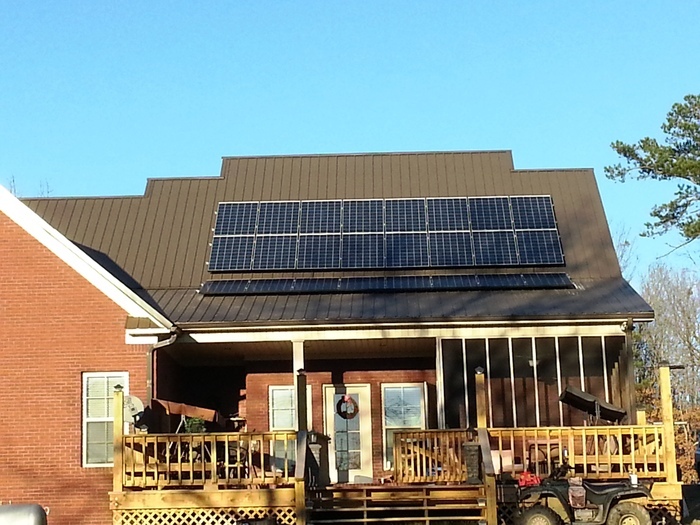 Donnell Bell is the owner of this 6kW solar PV system in Oxford, MS.
"I had a 6 kW system installed in December 2012. I have been very pleased with the quality & system performance, so much so, I am considering having another 2 kW added for a total of 32 panels. My system is on a slate colored metal roof & blends perfectly. I have the app on my phone & can monitor all functions of each panel or entire system at any time. I consider this as investment with a 7.2% yearly return on investment. This is with the TVA 12 cent premium contract I received by installing by Dec. 31 2012. I keep a binder with my power bill & solar credit each month. I receive the 9 cent per kW hour I produce off each bill, then receive the 12 cent per kW hour in a check from TVA approximately 2 months later. Then, I simply staple check receipt to original bill. I have never had a problem other than Northeast Power didn’t credit the 9 cent kWh for two months due to illness of employee, but it was soon corrected & up to date. I have a 676 kW hour average per month for last 16 months, with a high of 853 one month last Summer. The rain & clouds greatly affect the output & production. The great thing, it is producing every day, even when you’re on vacation . This equates to an average credit & check total of $142 a month since install with a 6 kW system. I have several months with a credit over what I used & several with a very small bill. My home has 3 deep freezers & 2 fridges. The common misconception, like my wife & son thought , is you can use more electricity & not worry about energy efficiency. No, the more you save & conserve , the more you make profit. There is also a 30% tax rebate till 2016 you receive on federal income tax. I am installing another 2kw to increase my output 25 – 30 %. As I understand it, the 12 cent premium has decreased to about 4-5 cents, but it is still a good investment over the long run. The common misconception is that you use the electricity you produce. No because you receive more than you pay for every hour you make. There are only about 2-3 others in Lafayette County & 1 in the City of Oxford, so solar is pretty new in this area. As you can guess, I have been pleased with the decision to install a solar system, since I am adding on. Mississippi Solar has been a pleasure to work with & very professional . I have recommended them to several friends."